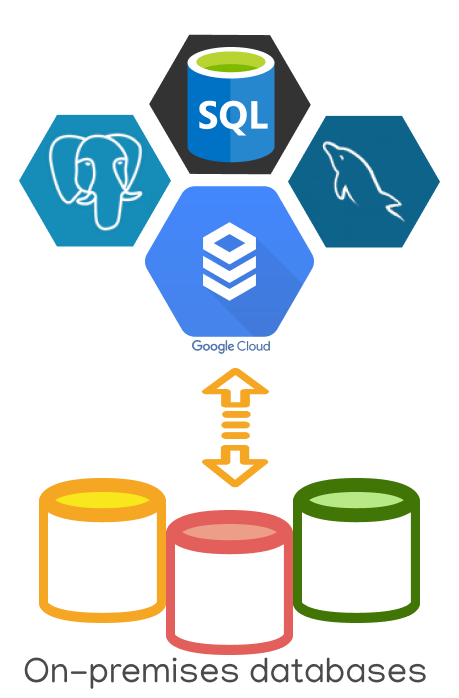 Google Cloud SQL Conversion and Sync. Google Cloud Platform is a set of cloud services offered by Google. The platform brings together various cloud computing, storage, security, cloud management, application development and other services that are directly launched on Google's servers. Cloud services can be used by software developers, cloud administrators and other IT professionals all over the world. Like all cloud platforms, Google has an advantage in saving infrastructure management, providing resources and configuring the network. Google also accentuates the evolutionary aspect of its infrastructure - constantly updated and optimized platform is powerful, economical and secure. DBConvert and DBSync software tools simplifies the process of migrating and syncing your data from/to Google Cloud instances. Our converters give users the ability to move the whole database or even a set of tables for faster conversion. Using of DBConvert tools do not require any special knowledge of database migration because all operations are easy to understand. To narrow your search have a look at products listed above. In addition to On-premise database migration you can easily move and replicate data between Google Cloud instance and many other directions. Google Cloud configuration manual for DBConvert.